Water polo is a fast-paced and exiting aquatic sport. With the Sydney Stingers, you'll play & improve your game technique in a supportive, LGBTIQ-friendly environment. If you're a current or former water polo player or competitive swimmer, we'd like to hear from you – even if you've had some time off. Alternatively, you may want to just try something new and make a bunch of friends. That's cool too. Our developmental squad caters for those not yet ready to play competitively. However, you must already be a strong swimmer. The best way to get into the Sydney Stingers is to attend one of our twice-yearly Water Polo Boot Camps. Our next boot camp runs over four sessions this March-April, and is suitable for beginners who already have strong swimming skills. 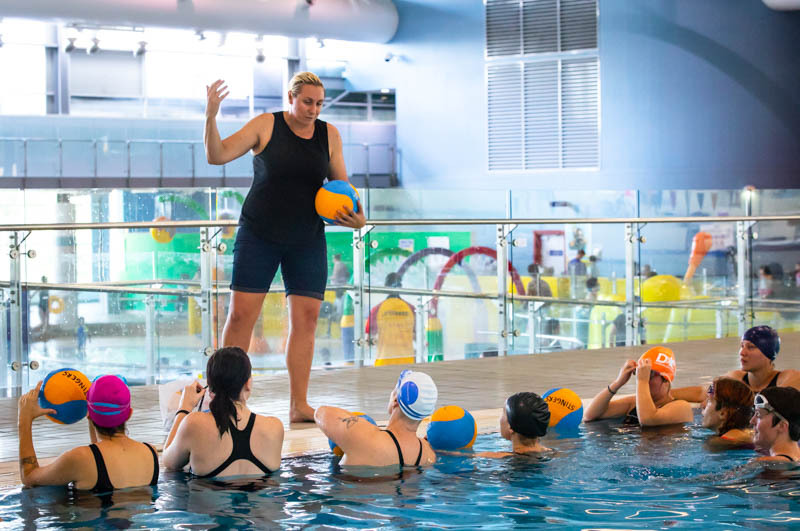 Experienced water polo players are also encouraged to participate as a skills refresher, and in order to get to know our club and your fellow new recruits. Attendance at all sessions is preferred (but not mandatory) and costs a total of $50 person for the entire course, plus pool entry at $6.40 each week. If you cannot make these dates, the next boot camp will be run in March-April 2019. Anyone is welcome (including those who have never played water polo before)... but you need to be a strong swimmer and able to tread water. If you have played before, you are invited to participate as a skills refresher, and to get to know our club and meet your fellow participants. We’re currently focusing on strong swimmers and/or those with at least some prior knowledge of water polo (e.g. at high-school or university/college level). Boot Camp is a mixed-gender environment and people of any gender identity (incl. transgender, intersex, genderqueer and non-binary people) are very welcome to participate. IS THE SYDNEY STINGERS JUST FOR MEN?! Anyone of any gender (incl. transgender, intersex, genderqueer or non-binary) is welcome to join our club and our boot camps. We launched our first two all-women's teams in March 2018, and we'd especially like to hear from women of any experience level who are interested in learning & playing water polo in a fun & friendly LGBTIQ-inclusive club. For information, visit our women's recruitment page, or just sign up below! do I need to be gay, lesbian or lgbtiq to join? READY? CLICK BELOW TO SIGN UP! If you have questions or want to discuss other options for joining, you can email us at info@sydneystingers.org.au or chat with us on Facebook Messenger. Membership fees cover costs incurred by the club including coaches, pool hire, new equipment and general running costs. Fees are subsided through active fundraising and sponsorship and represent excellent value for money to members – we're cheaper than many of the other Sydney-based water polo clubs! Affiliate membership (winter season) - $190*: Affiliates attend weekly training sessions and are welcome to participate in all club activities (incl. mid-week swim training). Full membership (winter season) - $250*: Full Members attend weekly training sessions, are welcome to participate in all club activities, and are registered to play in the Water Polo NSW Metropolitan competition. Membership at either level includes insurance cover through Water Polo Australia. * Winter memberships are valid for the 2019 winter season and expire September 1st, 2019, at which time members must purchase a full-year membership ($380 affiliate, $500 full member) if they wish to continue training and/or competing with us. Fees quoted on this page are correct as of March 2019, and are subject to change.